On this page, I attempt to keep an updated list of media appearances, big or small; basic income related or not; audio, video, or text; starting with the most recent. It’s not exhaustive, but it’s extensive. 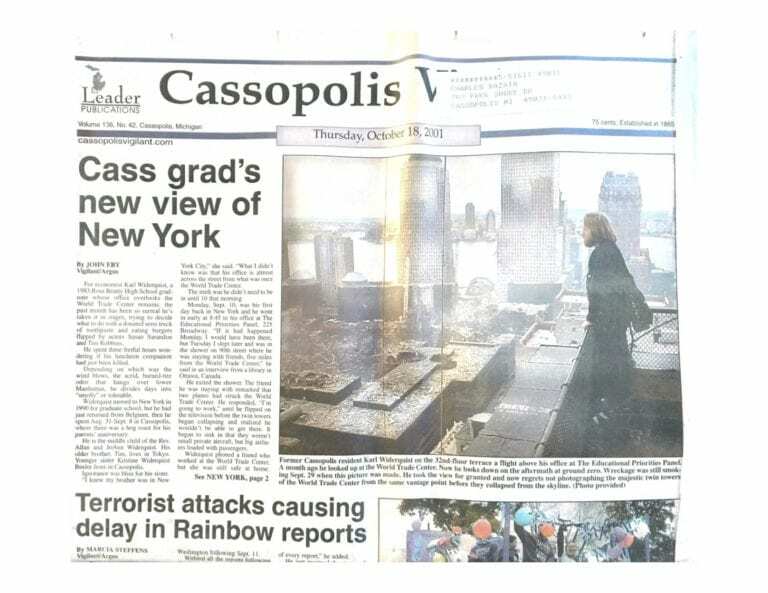 An English translation of the article is available at this link. The Natural Condition of Mankind [Review Article] by Maeve McKeown, European Journal of Political Theory, November 24, 2018. Also available on acadamia.edu. Going Global, a short video by the India Network for Basic Income, hosted by Sarath Davala, August 15, 2018. One Question: Universal Basic Income, (edited) by Cihan Aksan and Jon Bailes. The State of Nature Blog, 30th July 2018. Universal basic income: money for nothing, by Lou Foglia, Beme News (CNN’s YouTube Channel), July 25, 2018. 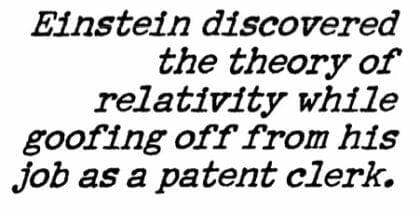 (Quotes Widerquist at 1:11). 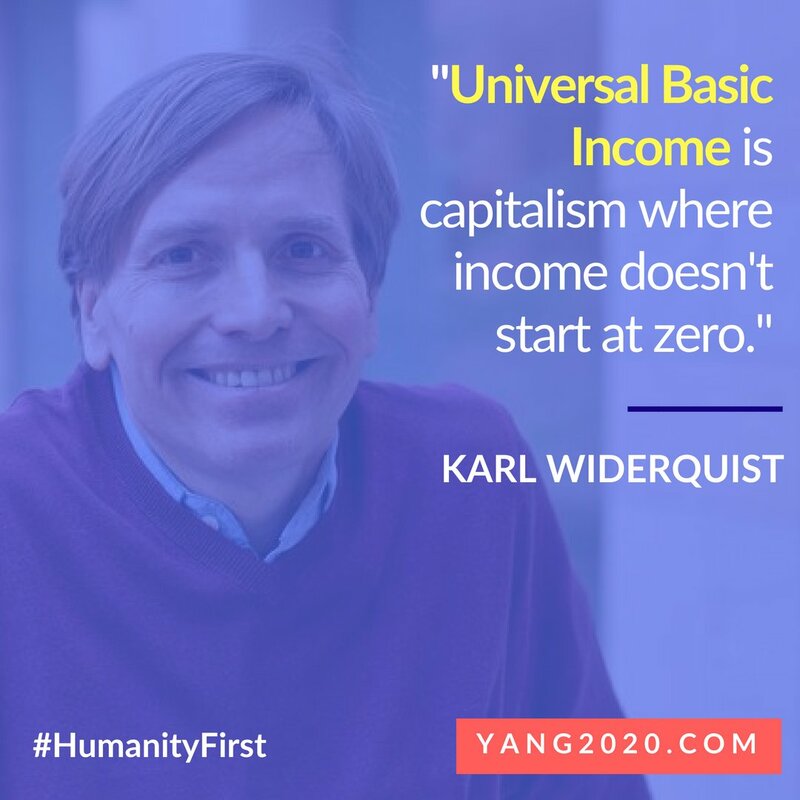 “Universal Basic Income is capitalism where income doesn’t start at zero,” Quote/Photo of Karl Widerquist, by Andrew Yang, Twitter, July 20, 2018. Barack Obama Voices Support for a Universal Basic Income, by Andrew Miiller, The Trumpet July 19, 2018. Prehistoric Myths in Modern Political Philosophy, lecture by Karl Widerquist, at the University of Paris, June 18, 2018 (Language: English). Interview with Karl Widerquist, questions by Victor Mardellat and Télémaque Masson, Canal-U.TV (Paris), June 18, 2018. (Language: English). Meet the economist who thinks basic income could be great for Louisiana, by Kat Stromquist, the Gambit (New Orleans), July 13, 2018. What Countries Have Tried Universal Basic Income? by NowThis World, July 1, 2018. Money for nothing: the truth about universal basic income, by Carrie Arnold, Nature, May 30, 2018. We’re giving up on universal basic income before the evidence is in, by Olivia Goldhill, QUARTZ, May 29, 2018. Could a Basic Income Plan End Poverty in Washington, D.C.?, by Robin Lloyd, Undark, May 10, 2018. Universal basic income: U.S. support grows as Finland ends its trial, by Annie Nova, CNBC, May 1, 2018. Basic Income: Better Than Welfare? (Interview of Karl Widerquist), by Adam Bearne, Scholar’s Mate PublicSquareNet YouTube Channel, May 1, 2018. What Happens When Every Citizen Receives a Universal Basic Income, by Leigh Anderson, LifeHacker, April 18, 2018. Chad Hartman Interviews Karl Widerquist on Universal Basic Income Link 1, and Duplicate Link 2 by Chad Hartman on WCCO-AM (reproduced on YouTube), Karl Widerquist YouTube Channel, March 8, 2018. 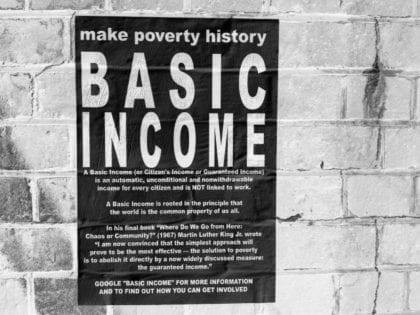 Basic income — now, in 20 years or never?, by Micgoat, Medium, February 1, 2018. Al Jazeera interviews Karl Widerquist about wealth inequality, Karl Widerquist’s YouTube Channel, YouTube.com, January 26, 2018. Quebec’s new basic income plan has proponents dreaming big, others skeptical, by Benjamin Shingler, CBC News, December 12, 2017. Why we need a Universal Basic Income, by Karl Widerquist, Karl Widerquist’s YouTube Channel, January 7, 2018. Your Call: Would a universal basic income build a new economic system?, by Laura Flynn and Renee Kemp, KALW, December 6, 2017. – Reprinted in The Seattle Times, 2017, When the economy doesn’t provide living-wage jobs, is free money the answer?. 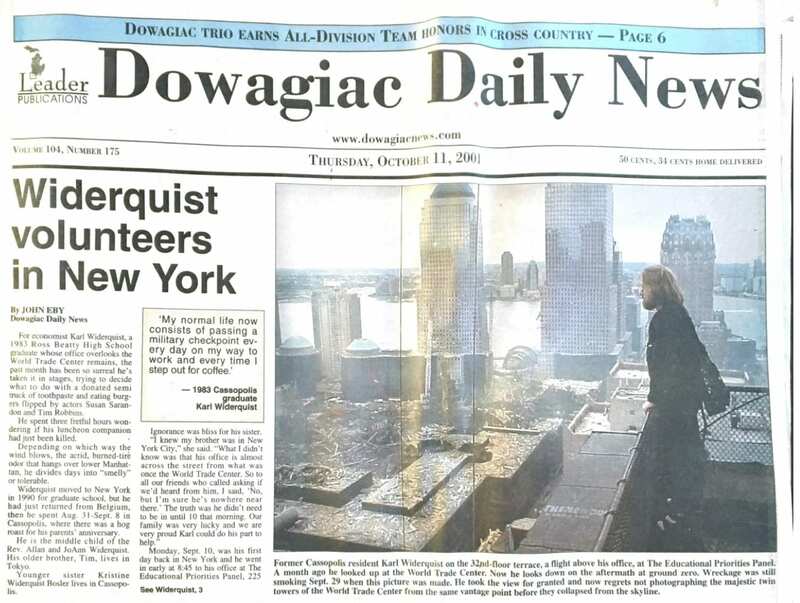 GU-Q don questions beliefs about prehistory in new book, by Tribute News Network, Qatar Tribune, November 13, 2017. Citizens Basic Income: An Idea Whose Time Has Come, by Maddy Halliday, Third Force News, October 24, 2017. Why We Need a Universal Basic Income, by Keri Leigh Merritt, Billmoyers, September 15, 2017. – Reprinted in Common Dreams, Why We Need a Universal Basic Income, 2017. How Much Basic Income Would Really Cost (Interview of Karl Widerquist), by Jim Pugh, The Basic Income Podcast, September 13, 2017. 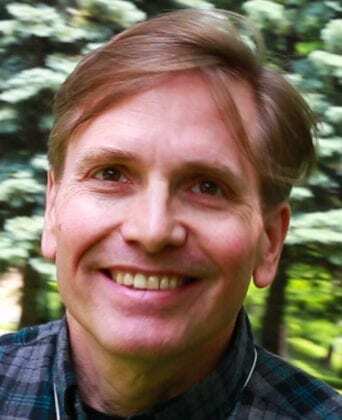 Reposted on Player FM, How Much Basic Income Would Really Cost, featuring Karl Widerquist, January 8, 2019. ADI Policy Forum – Part Two of Five – The Future of Work and Basic Income Options for Australia, talk by Karl Widerquist, Alfred Deakin Institute YouTube Channel, September 10, 2017. Would cash payments relieve job losses due to automation?, by Sarah Glazer, CQ Researcher, September 8, 2017. Guaranteed paychecks? Advocates push universal basic income, by Associated Press, App, September 8, 2017. ‘Something big has to change’: could Australia afford a universal basic income?, by Tim Dunlop, The Guardian, September 9, 2017. Friday free form, by TDN, TDN, September 7, 2017. Hawaii Considers A “Universal Basic Income” As Robots Seen Stealing Jobs, There’s Just One Catch…, by Tyler Durden, austrian.economicblogs.org, September 6, 2017. Wary of robots taking jobs, Hawaii toys with guaranteed pay, by CBS News, CBS News, September 4, 2017. Talking About Being Decent To Each Other – Paths To A UBI, by Tim Hollo, The Green Institute, August 19, 2017. Basic Income as a Strategy to Promote the Georgist Movement, by Karl Widerquist, Progress, August 5, 2017. 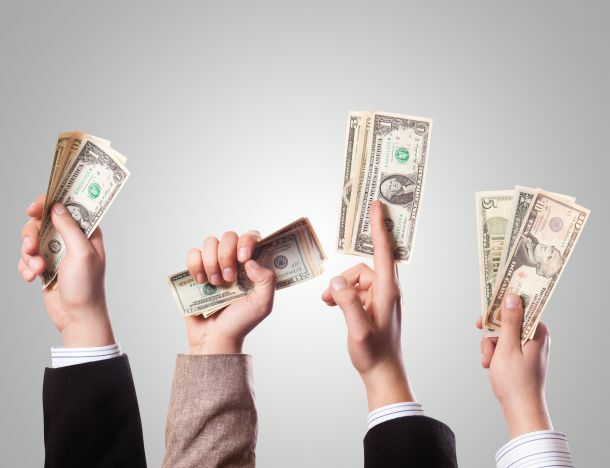 What If Government Just Gave Everyone Cash, No Strings Attached?, by Zach Patton, Governing, August 2017. Why universal basic income is gaining support, critics, by Kathleen Pender, San Francisco Chronicle, July 15, 2017. Jobber for Borgerlønn-reform i Norge [Working for Borgerlønn reform in Norway] (Interview of Karl Widerquist), by Elvind Kallevik, RAD102, July 11, 2017. Does this Canadian province have the solution to the world’s problem of unemployment?, by Charlie Young, Independent, July 8, 2017. Финский (де)мотиватор: изменят ли 560 евро жизнь безработного? [Finnish (de) motivator: will 560 euro change the life of the unemployed? ], by Oleg Boldyrev, BBC News, July 3, 2017. My own private basic income, by Karl Widerquist, OpenDemocracy, June 2, 2017. -Republished as audio for OpenDemocracy, read by Karl Miller, on Curio.io Souncloud channel, “My own private basic income,” November 2017. -Reprinted in Moon Magazine, 2017, “My own private basic income. Basic Income Could Empower Millions Of Indians, But India May Find Cost Too High, by Sherya Shah, IndiaSpend, June 24, 2017. Should all Americans receive a guaranteed income?, by KHOU Staff, Magnify Money, June 20, 2017. Universal basic income would pay everyone to improve quality of life, by Marisa Kendall, Lexington Herald-Leader, June 4, 2017. The Long, Weird History of Basic Income – And Why It’s Back, by David Flyod, Investopedia, May 30, 2017. Karl Widerquist steps down as BIEN’s Co-Chair to write Basic Income book for MIT Press, by Kate McFarland, basicincome.org. May 14, 2017. The benefits of an unconditional basic income, by Kim Darrah, World Finance, May 11, 2017. No Strings Attached: The Behavioral Effects of U.S. Unconditional Cash Transfer Programs [PowerPoint Presentation], by Ioana Marinescu, The Roosevelt Institute, May 11, 2017. Tech giants Elon Musk, Sam Altman push universal basic income concept, by Marisa Kendall, Santa Cruz Sentinel, May 5, 2017. “Basic Income,” by C3000 economic & political affairs April 27, 2017. SCOT TV Exclusive: Karl Widerquist on Universal Basic Income. UBI in Scotland, Part 2, by Scot TV, Scot TV YouTube Channel, April 4, 2017. 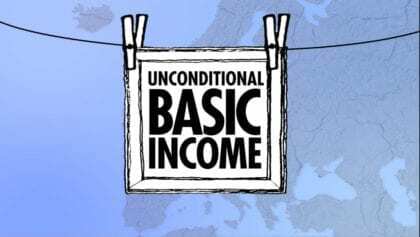 SCOT TV Exclusive: Karl Widerquist on Universal Basic Income. UBI in Scotland, Part 1, by Scot TV, Scot TV YouTube Channel, April 4, 2017. Universal Basic Income with Dr Karl Widerquist (Interview of Karl Widerquist), by Sam Barton, Talk of Today, March 14, 2017. Addressing the evidence deficit: how experimentation and microsimulation can inform the basic income debate, by Luke Martinelli, University of Bath Blogs, March 13, 2017. 13 MAART | WAT ALS WE EEN WERELDWIJD BASISINKOMEN INVOEREN VAN 100 EURO [MARCH 13TH WHAT IF WE INTRODUCE A WORLDWIDE BASIC INCOME OF 100 EUROS], by Mark Beekhuis, BNR, March 13, 2017. Georgetown Professors Questions Claims About Pre-History in New Book, by Georgetown University, Georgetown.edu, February 28, 2017. Universal basic income: Money for nothing or efficient equalizer?, by FriendsoftheFifthColumn, thefifthcolumnnews, February 19, 2017. Universal basic income could be tested in Fife within three years, by Cheryl Peebles, The Courier, January 30, 2017. Republished at Kar Widerquist’s YouTube Channel, Karl Widerquist gets Interviewed by Matt Oraflea on Universal Basic Income, January 21, 2018. GU-Q professor explores myths of prehistory in book, by The Peninsula, The Peninsula, January 8, 2017. What You Need to Know About the Massive Job Losses on the Horizon, by Thor Benson, ATTN, January 3, 2017. Free Cash in Finland. Must Be Jobless., by Peter S. Goodman, The New York Times, December 17, 2016. Elon Musk says robots will push us to a universal basic income—here’s how it would work, by Catherine Clifford, CNBC, November 18, 2016. Al Jazeera interviews Karl Widerquist, previewing Trump-era U.S. politics, (part 2), by Al Jazeera (reproduced on Karl Widerquist YouTube Channel), November 10, 2016. Al Jazeera interviews Karl Widerquist previews Trump-era politics, by Al-Jazeera (reproduced on Karl Widerquist YouTube Channel), November 10, 2016. Al Jazeera interviews Karl Widerquist on election day: 3rd of 3 appearances, by Al Jazeera, Karl Widerquist’s YouTube Channel, November 8, 2016. Al Jazeera interviews Karl Widerquist on election day: 2nd of 3 appearances, by Al Jazeera, Karl Widerquist’s YouTube Channel, November 8, 2016. Al Jazeera interviews Karl Widerquist on election day: first appearance, by Al Jazeera, Karl Widerquist’s YouTube Channel, November 8, 2016. Al Jazeera Interviews Karl Widerquist on the U.S. Election 05 Nov 2016, by Al Jazeera, Karl Widerquist’s YouTube Channel, November 6, 2016. The Newsmakers: Is veganism eco-friendly and Poverty in the US (Interview of Karl Widerquist), by Imran Garda, The News Makers on TRT World YouTube Channel, November 3, 2016. Al Jazeera interviews Karl Widerquist on the reopening of Clinton email Investigation, by Al Jazeera (reproduced on Karl Widerquist YouTube Channel), October 31, 2016. INTERVENCIÓN KARL WIDERQUIST EN EL ENCUENTRO “VIENE LA RENTA BÁSICA” [Speech by Karl Widerquist at conference titled “Basic Income is coming”], by Karl Widerquist, Solidarias YouTube Channel, October 16, 2016. Nordic Conference on Basic Income Pilots, a talk by Karl Widerquist, Politics-Music-Culture YouTube Channel, September 22, 2016. Tudi v Kanadi eksperiment z univerzalnim temeljnim dohodkom [In Canada, too, the Universal Income Generation], by Ekonomija, MLADINA, September 3, 2016. (1/5) “A story to tell” When life is merciless / Creathon on basic income 2016, by Creathon, MFRB – Mouvement français pour un revenu de base (French Movement for Basic Income YouTube Channel), August 29, 2016. World Social Forum 2016 / Basic Income, a Major Social Innovation for the 21st Century, talk by Karl Widerquist, MFRB – Mouvement français pour un revenu de base (French Movement for Basic Income YouTube Channel), August 27, 2016. Swiss Basic Income Vote Sparks Discussion Despite Failure to Pass, by Sputnik, Sputnik, July 6, 2016. An Idiot’s Guide to Universal Basic Income (Interview of Karl Widerquist), by Alex King, Huck, June 10, 2016. Would You Like Some Money, Just For Being A Person?, by Karen Pinchin, Good Magazine, June 7, 2016. Your Call: Is it time for a guaranteed basic income? (Interview of Karl Widerquist), by Rose Aguilar, Your Call on KALW, June 6, 2016. “Switzerland votes against state-provided basic income,” by Ralph Atkins and Gemma Tetlow, Financial Times, June 5, 2016. ‘Unconditional basic income is a response to the loss of freedom in our economy’ – Karl Widerquist (Interview of Karl Widerquist), by Radio Sputnik, soundcloud.com, 2016. What Would Happen If We Just Gave People Money?, by Andrew Flowers, FiveThirtyEight, April 25, 2016. Alaska’s annual dividend adds up for residents, by Rachel Waldholz, MARKETPLACE, March 16, 2016. Canada Is About To Start Giving Away Free Money, by Shane Fero, HuffPost, March 9, 2016. These Tech Wizards Want To Pay People For Doing Absolutely Nothing, by Shane Fero, HuffPost, January 29, 2016. Time For A Guaranteed Basic Income?, by Tom Ashbrook, NPR’s On Point, January 14, 2016. Alaska’s dividends help make us equal and protect our common wealth, by Charles Wolforth, Anchorage Daily News, January 11, 2016. American Achieves First Crowdfunded Monthly Basic Income, by Scott Santens, scottsantens.com, December 14, 2015. Even Big Banks Think Robot Automation Will Lead to Further Income Inequality, by Jack Smith IV, MIC, November 11, 2015. Can Basic Income Bring About the Next Creative Renaissance?, by Jack Smith IV, MIC, September 18, 2015. Basic Income AMA Series: I’m Karl Widerquist, co-chair of the Basic Income Earth Network and author of “Freedom as the Power to Say No,” AMA, by Karl Widerquist, Reddit r/IAmA, July 4, 2015. What If Everybody Didn’t Have to Work to Get Paid?, by David R. Wheeler, The Atlantic, May 18, 2015. Why the Tech Elite Is Getting Behind Universal Basic Income, by Nathan Schneider, Vice, January 6, 2015. What Can We Learn From A Town That Beat Poverty, by Lane Anderson, Deseret News, January 5, 2015. “The Guaranteed Basic Income & the Libertarian Dilemma (w/ Karl Widerquist),” by Sam Seder, The Majority Report, 2015. We’ve Actually Tried Negative Income Taxes, And They Seem To Work, by Ben Southwood, Adam Smith Institute, November 6, 2014. ”Big Casino” og friheden som magten til at sige nej ( “Big Casino” and freedom as the power to say no), by AF Erik Christensen, MODKRAFT Magazine, September 26, 2014. Money for nothing: Mincome experiment could pay dividends 40 years on, by Benjamin Shingler, Al Jazeera America, August 26, 2014. Karl Widerquist at North American Basic Income Guarantee Conference, a talk by Karl Widerquist, Basic Income Canada Network YouTube Channel, July 15, 2014. Basic Income Heroes: Karl Widerquist Edition, by Karl Widerquist, SquareSpace.com, Jule 13, 2014. $2750 a month for every adult, guaranteed? Switzerland’s considering it, by Marco Werman, PRI’s The World, October 14, 2013. “Anti Wage-Slavery, Pro-Freedom Quotations Of The Week 981-983,” by Jack Saturday, blogspot.com, May 13, 2013. Interesting times ahead for Alaska Permanent Fund, by Karl Widerquist, Anchorage Daily News, June 3, 2012. How Alaska can avoid the third-stage resource curse, by Karl Widerquist, Anchorage Daily News, February 27, 2012. 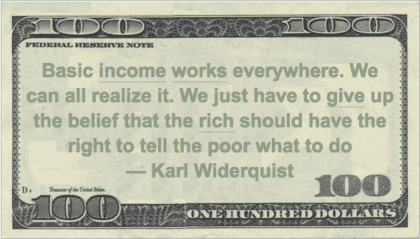 Karl Widerquist on the current crises and Basic Income (Interview of Karl Widerquist), by Joerg Drescher, Basic Income Earth Network YouTube Channel, December 16, 2011. 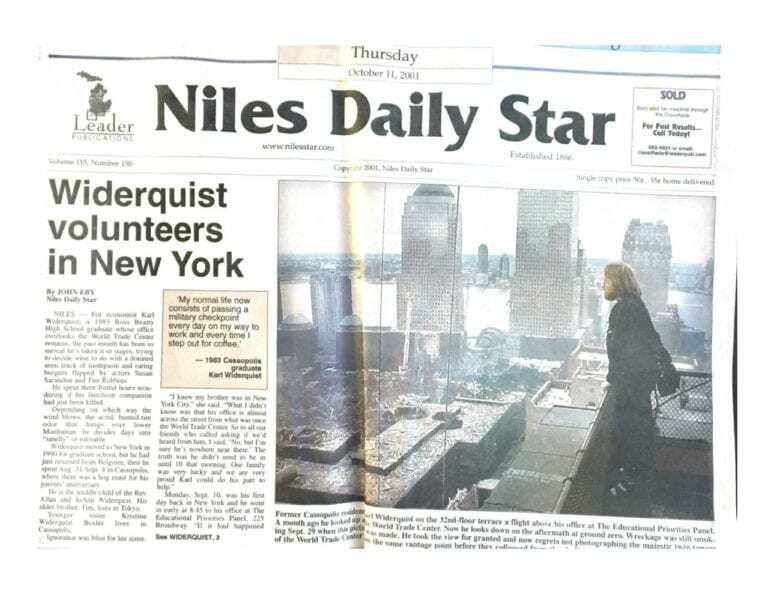 The Indepentarian (blog) and news postings, by Karl Widerquist, Basic Income News, 2011-present. John Maynard Keynes: Economic Possibilities of Our Grandchildren, by Karl Widerquist, Dissent Magazine, 2006. The Basic Income Guarantee, by Karl Widerquist, greens.org, 2001. Maybe the election will shame us into sharing our wealth, by Mark Satin, Radical Middle, November 2000. The Money-Making Ethic, by Karl Widerquist, Chronogram Magazine, 1999. Blaming The Worker, by Karl Widerquist, Chronogram Magazine, January 1998. The Bass Player, by Karl Widerquist, Cake: The Nonmusic Music Magazine, February 1997. Make Way For Other Toys, by Karl Widerquist, Cake: The Nonmusic Music Magazine, 1996. The Book is Dead, by Karl Widerquist, Cake: The Nonmusic Music Magazine, 1996. Breaking Away to the Next Red Light, by Karl Widerquist, Cake: The Nonmusic Music Magazine, 1996. Thanks. Nice of you to say.